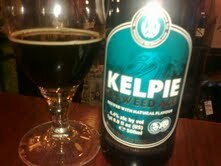 When Kelpie Seaweed Ale arrived I immediately thought of Dollymount strand in a bottle. Not the most appealing comparison but I guess you link potential flavours with memory sequence. I've heard people compare the flavour of Schlenkerla Marzen to everything from kippers/ rashers/ Smith's Bacon fries and spiced beef. So nothing is impossible. This pours similar to the Zeitgeist from Brew Dog - A black lager. This however is an ale with a thin white head which almost immediately dissipates. The nose was completely different than I anticipated. It initially smells candied - kola and marzipan but after serving 2 customers and reverting back to the so-called seaweed beer - I got it! Thankfully it's not Dollymount strand. It's actually a subtle coastal smell. Salty and almost medicinal. The palate has a nice carbonation with sweet caramel flavours which finish like slightly bitter salt water...and I just ruined it!!!. I suggest you try this with a couple of Californian Sushi rolls or if you're like me and don't buy into the raw fish buzz - Anything that once originated from the sea and that includes Captain Birds eye fish fingers. Available from Deveney's of Dundrum. The beer-can chicken is progressing, although my oven may be too low-ceiling for it to actually stand up. The recipe is in here http://www.amazon.com/Cliff-House-Hotel-Cookbook/dp/0547338279 Although you'll find a bunch of variations online if you google beer-can chicken. Let us know how the chicken copes with the can of beer. That all sounds pretty seedy! Seaweed is usually the only thing I leave behind at a Sushi bar. But, somehow, the idea of it in an ale is hugely appealing.